This said, I believe it's a worthwhile exercise to break down some of the more intermediate IDP stat categories. We will take a look at IDP snap counts, tackle frequency, sack frequency, and points per snap within this stat metrics series. This specific release will focus on IDP Sack Frequency. 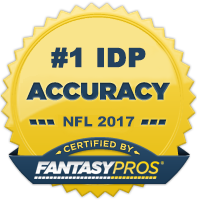 These resources will live on the site leading into the start of the season, so that we can use them as a guide to help inform our 2016 draft decisions. There are separate tabs for DL, LB, and DB to make filtering through the data easier. Players needed to have 450, 350, and 450 snaps or greater respectively to be included within the data set.